MASCULINE BAY RUM SCENT: With this beard conditioner, you won’t just have a healthy beard that feels softer than ever before, you’ll also enjoy a captivating, manly Bay Rum aroma. 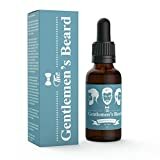 This entry was posted in Organic Health Products and tagged Beard, Gentlemens by Organic Health. Bookmark the permalink.